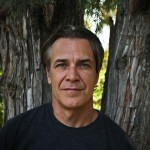 Chip Livingston is the author of the novel OWLS DON’T HAVE TO MEAN DEATH (2017), the story/essay collection NAMING CEREMONY (2014) and the poetry collections CROW-BLUE, CROW-BLACK (2012) and MUSEUM OF FALSE STARTS (2010). Chip’s writing has recently appeared or is forthcoming in Prairie Schooner, Ploughshares, South Dakota Review, Cincinnati Review and on the Poetry Foundation’s and Academy of American Poets’ websites. Chip teaches in the MFA programs at Institute of American Indian Arts and at Regis University.